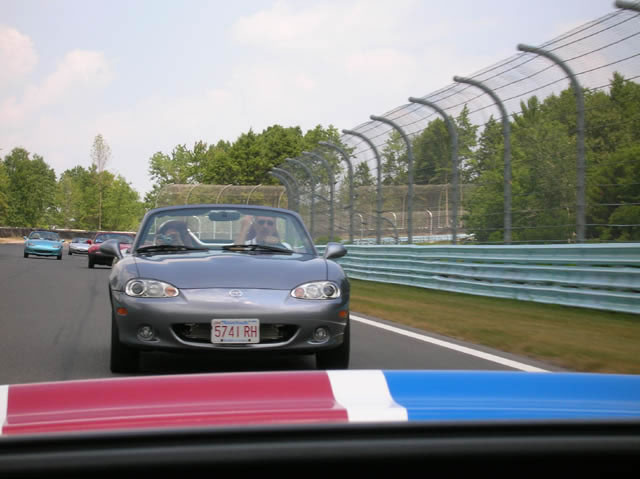 Most of us purchased the Miata to enhance our lives, to expand our world, or to provide escape. 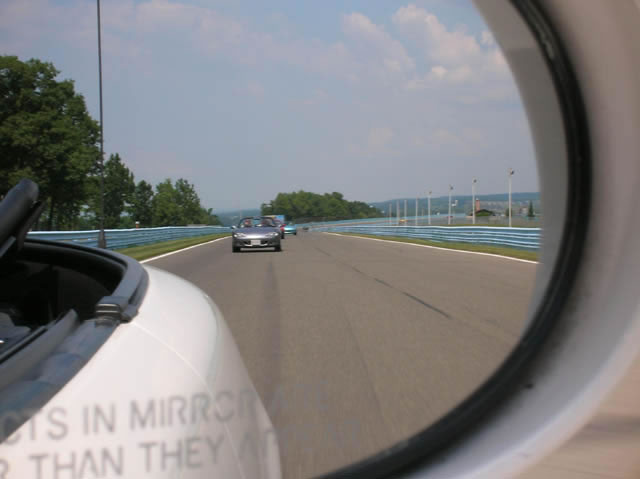 What we sometimes overlook is the educational value of the Miata experience. 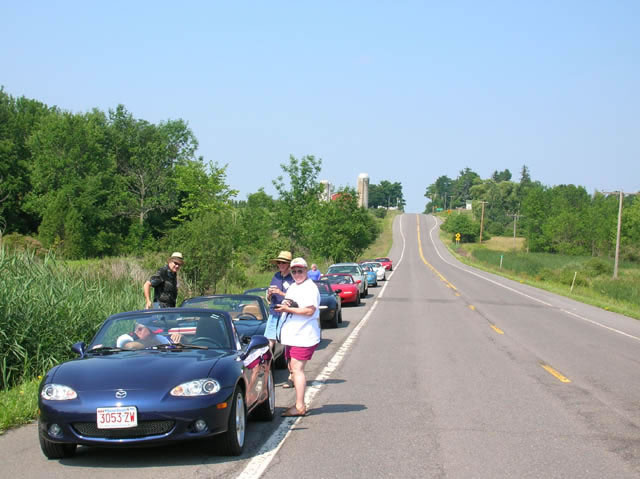 Seventeen happy Miatas left Massachusetts on a sunny July morning. 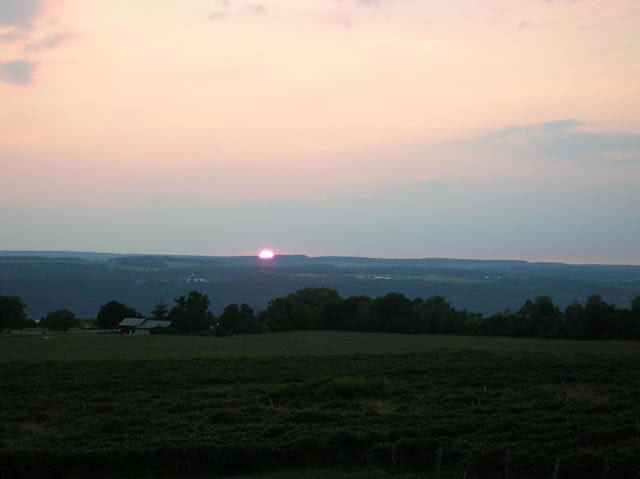 The plan was for a quiet weekend of touring and tasting in mid-state New York. 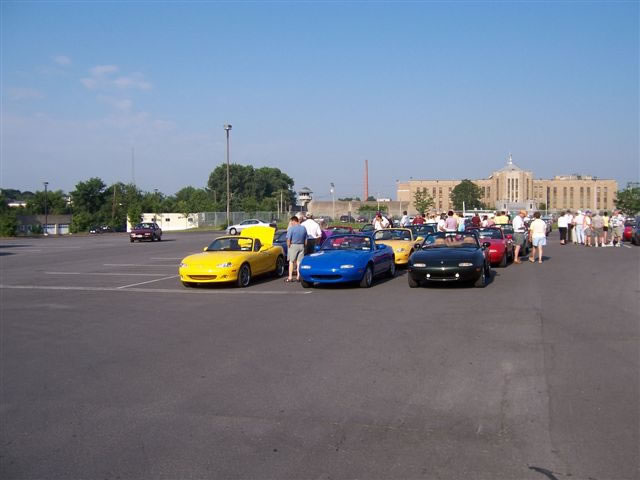 But as often happens when Miata owners get together, the results far surpassed the plan! 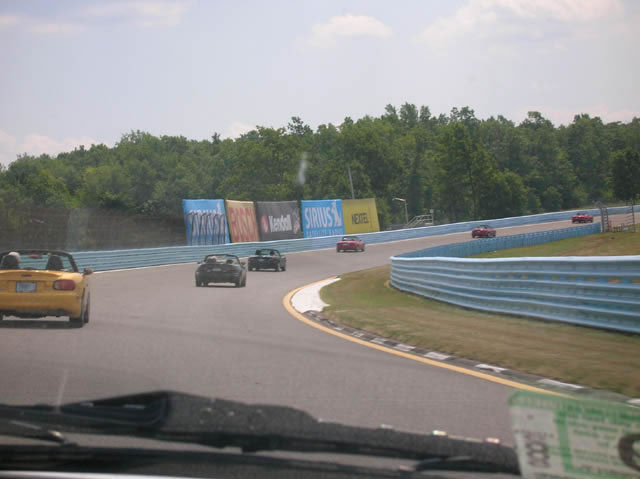 After a healthy lunch of burgers and chicken served in foil packets, we were cruising along the New York State Thruway relishing in the delight of our two-seater fun machines. The traffic was heavy both with folks rushing home at the end of the long work week, and vacationers like us who were en route to our tranquil destinations. When that combination came together, it resulted in our first lessons of the weekend. A large truck pulling a ditch digging machine on a trailer passed along side us at a very high rate of speed. 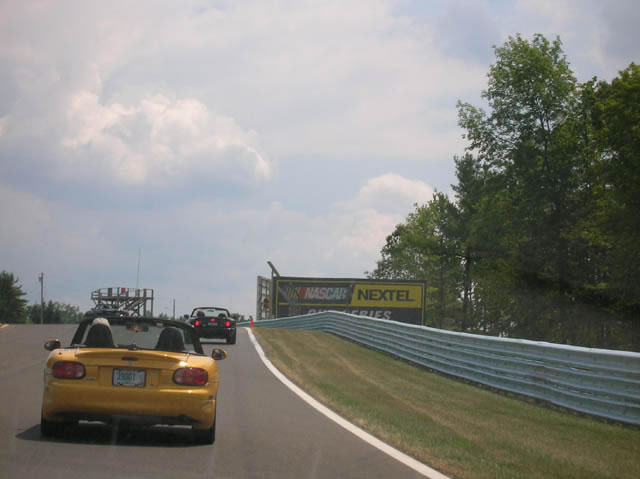 For whatever reason, the driver decided to reenter the travel lane at the very spot that Brenda and Jim Powers were occupying with their 1999 Miata. The front right tire of the truck struck the Miata at the driver’s door, causing the car to spin toward the front of the truck. 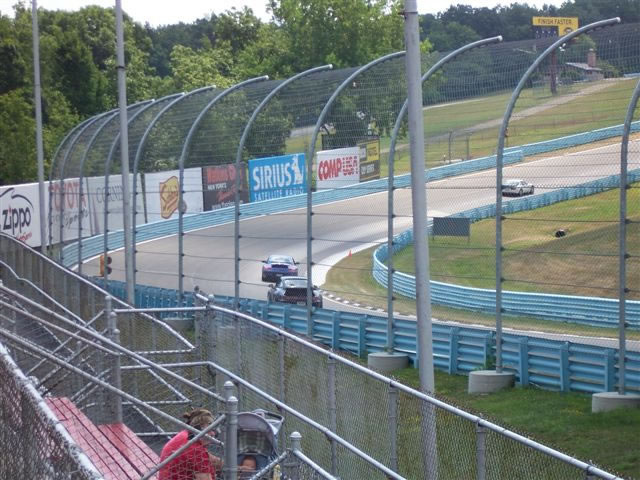 As the truck continued to push the Miata at this strange angle down the Thruway, the truck driver swerved left, causing the trailer to overturn and drag the truck into the median with a cloud of dust and dirt. Jim and Brenda, now free from the huge tires and bumper of the truck, also spun into the median and continued to slide along the grass way, pointed toward the passing lane. 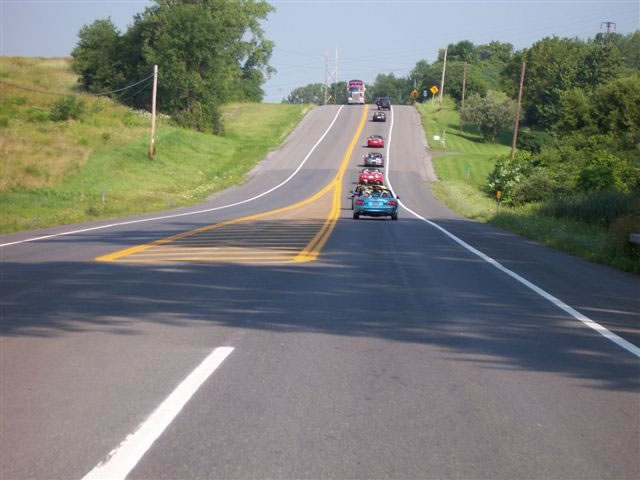 Thanks to Jim’s driving skills and the superb balance and handling of the Miata, they did not overturn and when all the dust and dirt subsided, Jim and Brenda sat in the median strip coughing up dust, but uninjured. 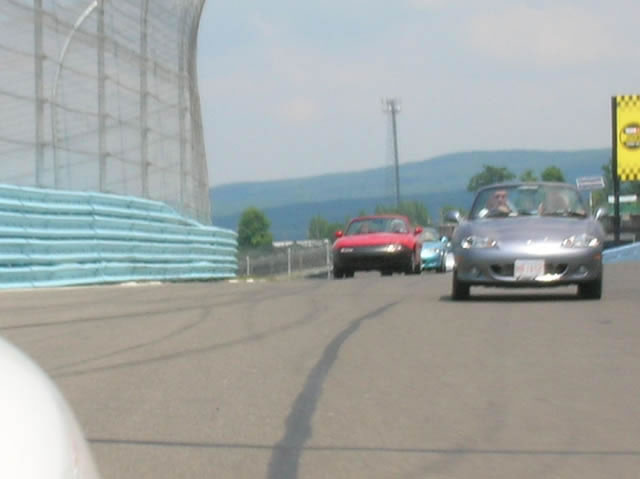 Jim, Brenda and the Miata all performed beautifully, but the Miata was done for this trip! What were the lessons of the day? 1) Life can change in an instant, you have to make the most of every minute because you have no idea what will happen in the next. 2) The Miata is one hell of a car that can take on those ten times its size and still hold its own while protecting its passengers. 3) Traveling with a club increases your fun, enhances your safety, and it comes in handy in an emergency! Before you start thinking that this accident was because the Miata was too small to see, forget it! There was a full line of vehicles of all sizes that were plainly visible as the truck driver approached. 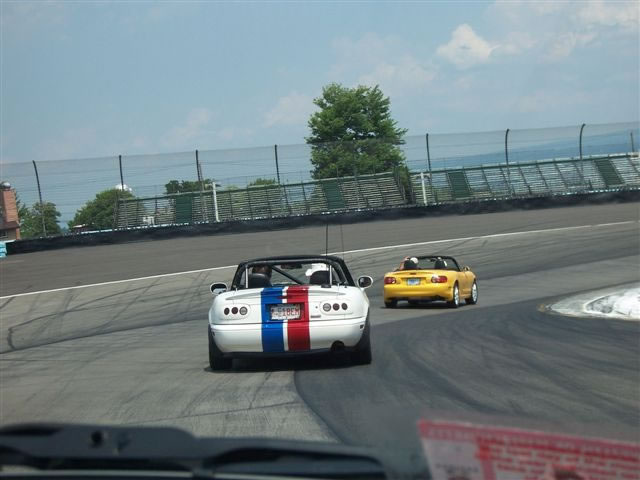 The Miata was just in the wrong place at the wrong time, but it wasn’t about size. We all regrouped and continued on with the trip. 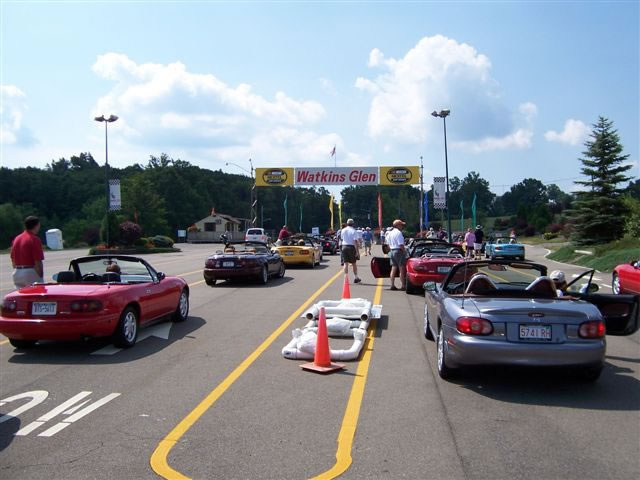 The next day, the singles doubled up with the orphaned Jim and Brenda and we met the members of the Mid-State Miata Club in the parking lot of the hotel. 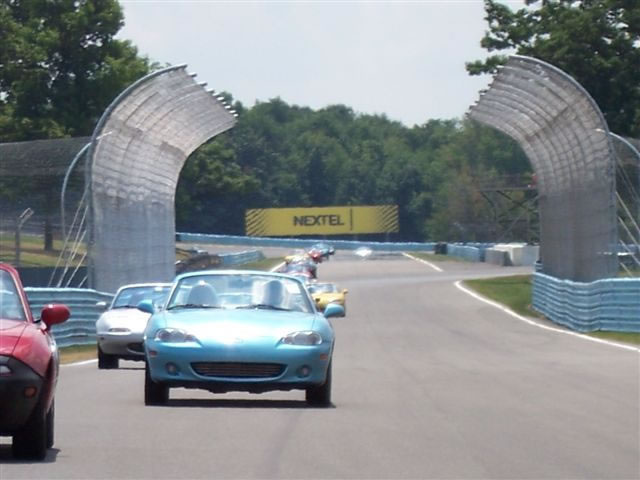 By the time we left, there were more than 45 Miatas of every year and color caravanning over beautiful rolling hills and back country roads to the Watkins Glen Raceway. After lunch and four very fast parade laps around the track, we left with a better appreciation for the capability of our cars. 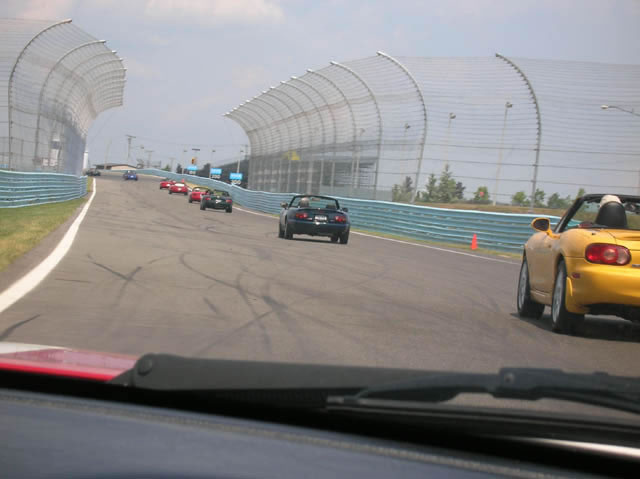 The Porsche Club may have rented the track for the day, but I know they didn’t have any more fun than we did! After a stop for some wine tasting, photographs and conversation, there was a great dinner, a beautiful sunset and a spirited ride to the hotel under a starry night sky. 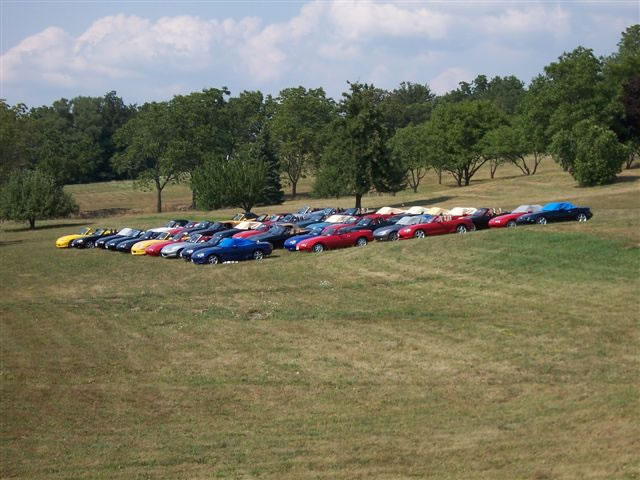 As we gathered for a group photo the next morning, I realized another lesson of the Miata. 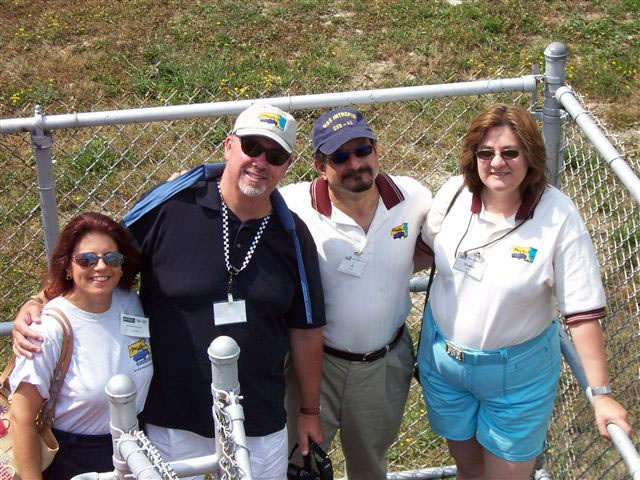 The backdrop for our photo was the state prison adjacent to the parking lot. There it was in stark contrast; the ultimate loss of freedom in the background, and the obvious celebration of freedom in the foreground. After the photo we left in different groups, some taking the fast route home, others the leisurely scenic ride, but all of us were better for the experience. 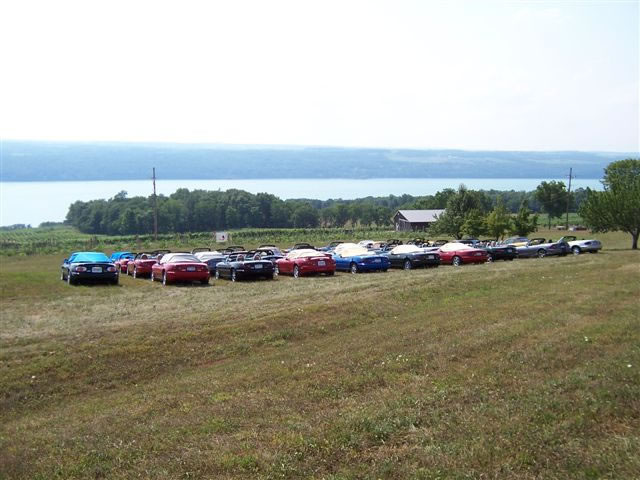 Thank you to Bob Lannin for planning and leading this trip and thanks to Lee Maddy and all the members of the NY Mid-State Miata Club for a fantastic scenic tour. 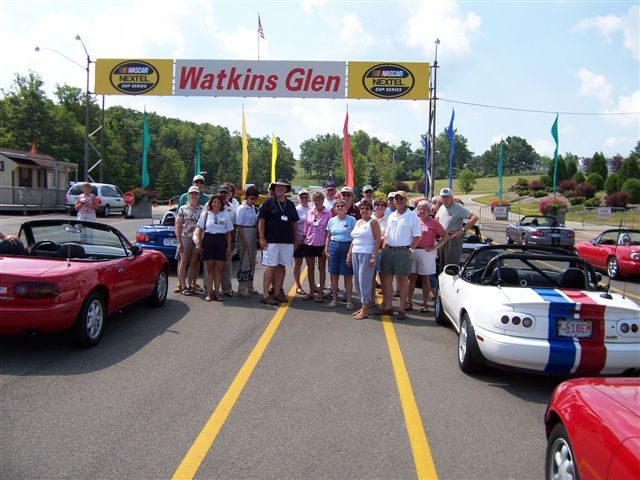 A special thank you goes to Al and Sheila, Les Barton, and all the members who came to the aid of Jim and Brenda, demonstrating once again that the Miata brings out the best people and the best in people. 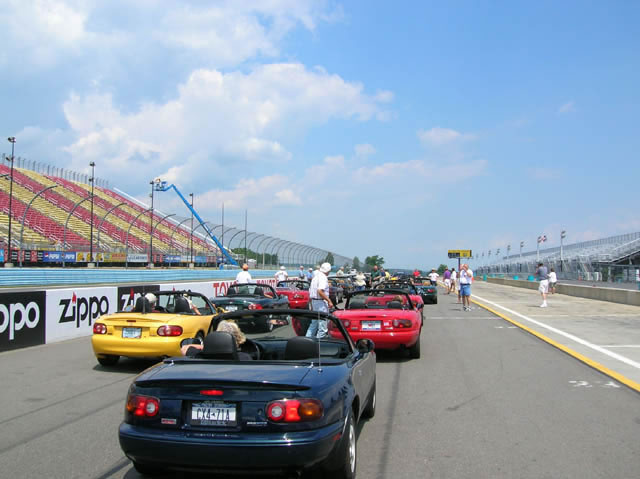 If you are one of those members who read the trip reports but have never participated in a trip or a day ride, you are missing an opportunity to truly enhance the joy of Miata ownership while learning about the joys of life. Check the schedule and come along!